There are rumours that the PlayStation3 will be the next console to offer stereoscopic three-dimensional visuals. Apparently, Sony "fully intends" to support 3D output, both for gaming and Blu-ray playback as of 2009. I have received confirmation from Blitz Games Studios that Sony "fully intends" to support stereoscopic 3D gaming and Blu-ray 3D on the Sony Playstation 3 (PS3) in 2009. Blitz will of course be helping back this technology with their Blitz Tech engine. The best part is console support will only need a bios upgrade to work, and we are told that the ability to add this capability via bios may be unique to Sony PS3 versus the other console solutions. Blitz Games Studios has developed the ´King Games´ for Burger King, ´Fuzion Frenzy´ and ´Zapper´, as well as the questionable ´Reservoir Dogs´ and ´Bad Boys II´. The company also licenses middleware technology called BlitzTech, which they claim has "powered over 25 titles, totalling over 70 releases covering 8 platforms". It would appear, though, as if the studio has been unable to sell their technology to other developers. Nevertheless, the BlitzTech features make an impressive read. The paragraph about 3DTV is accompanied by the following mock-up - bearing a PlayStation3 controller. BlitzTech is at the forefront of rising interest in 3D displays for the home with exciting possibilities for presenting content with higher realism and sense of player immersion in breathtaking 3D. 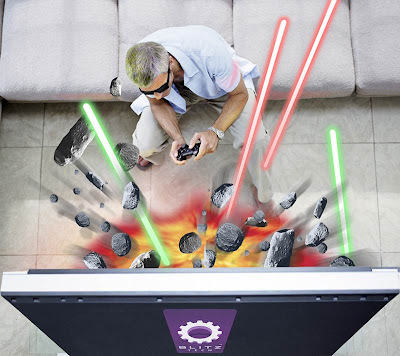 In a complex market with competing technologies the key to increasing adoption is to ensure compatibility with the widest possible range of displays to unlock the potential of amazing 3D display hardware out there. The engine provides a highly flexible stock solution that supports all current suitable formats including active and passive glasses as well as newer auto-stereoscopic displays not only on PC but uniquely also on high-definition console - an industry first. While there have always been third party solutions for converting standard video signals into stereoscopic 3D images by means of shutter glasses, this would be only the second time ever that a console manufacturer fully endorses the technology, after Nintendo's failed Virtual Boy. I am a little suspicious of this rumour. Auto-stereoscopic displays still are too expensive to reach a mass market. Of course, videogame companies have been toying with this technology for years. But, currently, headgear is the only possible means to bring 3D visuals to a large audience. And what normal person wants to sit on a couch wearing glasses? Ubisoft is developing a 3D game, which apparently will use shutter glasses. But in a trailer from 2007, the publisher made it quite clear that they want to do away with those glasses, if possible. I am sure that there is some truth to this rumour. If Sony is being mentioned, they must have been in talks with the studio. However, I can only cynically assume that both the studio and the so-called advocacy group blew Sony's positive feedback totally out of proportion. After all, building hype is just what these two companies want. Having said that, I would absolutely love it if this rumour was true and I could watch my EyePet run circles around me next year. That would no doubt become the system seller which Sony so badly needs. i onece thought there would be 3d this gen but i really doubt we will see it brought in on any current consoles. I believe if sony were to introduce 3d on the ps3 people whould feel ripped off that they have to buy 3d add ons for there console to support 3d games etc. 3D will happen in gaming but it wont be this gen and it may not even be next gen. Lets Tap for Wii I have played and its a very interesting concept. I think there can be some games that could be developed using this concept without even touching the controller to play. A very informative post as always, Mr Falafel. IMO, the PS3 was developed both as a game console and as a trojan horse for HDTV and blu-ray. If I am not mistaken, the use of 3D would mean using a media other than HDTV in order to show 3D (I am talking about stereoscopic, "no-glasses" 3D), thus giving SONY a hard time selling their bravia brand. I agree with you : 3D graphics would certainly give the PS3 the kind of boost they need, but will they risk to push this at the cost of HDTV (and, to a lesser extent, blu-ray)? Hey falafel kid. Do you have any information on whether Fatal Frame 4 or Disaster is coming stateside? Seems there is a lot more to PS3 going 3D then I thought. virtual reality is really the future. so who are we? I need to think fsdjhjhl of a two of oakley frogskins .After an extensive time operating under the sun, I feel rather uncomfortable, and I can have a couple oakley frogskins to support me protect my little brown eyes. I've lived with bad eyesight for virtually every lengthy time period, I need to think of a two of oakley jawbone to support me view items obviously and guard the eye by powerful sun light and extra violet radiations. Subsequently, I want to purchase a couple oakley flak jacket at on-line spectacles shop to be a end reaction to their higher high class and tolerable prices.Make a gross sales pitch and train your people today to consequence your shoppers to obtain your oakley radar . in scenario you could have perfect sales guys and saleswomen, it may improve ones margins. with comparability to help clothes, Oakley sunglasses tend to be attempted oneasily with not significantly more than something like 20 seconds. with scenario people exhibit most of these in check-out companies, your people can sporting them whilst delaying with regard to their change and own it within their buy which shows extra profit. Oakley shades. Diablo III GoldEven so, suitableness is a great one.On the whole, bifocal protection Oakley sun glasses make reference to an exclusive type of specs which will provide the capabilities each ordinary Oakley glasses and protecting safety Cheap Guild Wars 2 GoldOakley glasses. There are clearly 2 major factors of such type of eyeglasses.